In the Briegel lab, we are interested in understanding how microbes sense and respond to their environment. How are the cells able to actively seek out their preferred environmental niches, how can they effectively evade toxins and predators, and how can they adapt to thrive in changing environments? Nearly all motile prokaryotic cells utilize a highly sensitive and adaptable sensory system to detect changes in nutrient concentrations in the environment and guide their movements towards attractants and away from repellents. This chemosensory system allows the cells to selectively colonize preferential environments and is also involved in host infection by some pathogenic bacteria. The bacterial chemoreceptor array is a highly organized sensory patch composed of thousands of transmembrane receptor proteins. Attractants and repellents bind to the sensory domains of these receptors, thereby regulating activity of the histidine kinase CheA, which phosphorylates a soluble messenger protein. 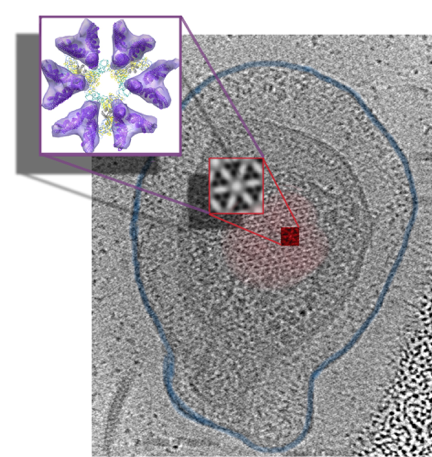 This messenger protein in turn diffuses through the cytoplasm to the flagellar basal body, where it modulates the direction of flagellar rotation. Chemoreceptor arrays are composed of trimers of receptor-dimers that are connected by rings of the histidine kinase and a linking protein, CheW. We are now working towards unraveling the structural changes that occur upon attractant binding, and understand the basis for the high cooperativity of the chemoreceptors in the array. 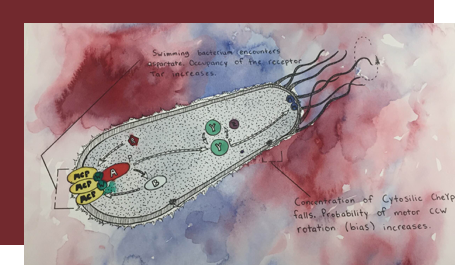 Besides unraveling the detailed structure and function of the chemotaxis system in model organisms, we are interested in understanding their unexplored diversity across the bacteria and archaea, how they control bacterial behavior and how they are involved in pathogenicity.